In 1866 banker Samuel C. Thompson and his wife, the former Abigale E. Sherman, moved into their new 23-foot wide brownstone-fronted residence at the southeast corner of Madison Avenue and 41st Street. The first president of the Chase National Bank, Princeton Alumni Weekly would later call him "a man of unusual prominence." The couple's only child, Ferris Sherman Thompson, was 17-years-old when Samuel died in No. 297 on April 10, 1884. The amount of Thompson's large estate was suggested in his bequest of $100,000 to his mother--more than $2.6 million today. Abigale, who was better known as Abby, reentered the social whirl following her period of mourning. On January 29, 1888, for instance, The World reported on the dinner she hosted in the Madison Avenue house. Abby's Italianate brownstone was decidedly out of date by the early 1890's. By now the millionaires of Fifth and Madison Avenues were moving further northward and erecting limestone or marble palaces near Central Park. Abby followed suit only in part. She opted not to relocate, but to demolished her old home and replace it with an up-to-date mansion. Her choice of Brooklyn-based architect Montrose W. Morris was somewhat surprising. Although well-established, he was best known for designing apartment buildings, most of them in Brooklyn. His design for the Thompson mansion, however, would hold its own with the those of the best Manhattan architects. His plans, filed in May 1894, estimated the cost of construction at $100,000--or about $3 million today. There was one feature of the design which needed City approval. The bay window on the 41st Street side technically projected "beyond the house-line." On May 23, 1894 the Department of Parks resolved to allow the bay, as long as it did not project more than two feet, four inches from the facade. Abby was charged $200 "for the privilege." Her completed granite and marble Italian palazzo rose five floors. The understated entrance within the rusticated ground level sat behind grand iron gates. Abby's controversial bay window upheld one of four balustraded stone balconies at the third floor. The openings on Madison Avenue at the second through fourth floors were arranged in framed groups of three, separated by engaged columns at the second and pilasters at the third and fourth. A regal stone balustrade crowned the cornice. The New York Herald later described the interiors of what it called "one of the most distinctive dwellings in Manhattan. "Rare teakwoods, brought from India, went to embellish the living and drawing rooms. The marble staircase with balustrades of solid bronze, it is said, cost $125,000. Italy was scoured for its costly stained glass and massive fireplace marbles. The lighting fixtures were in keeping with the other embellishments." Abby Thompson would enjoy her new home for about a dozen years. She was in Paris on November 20, 1907 when she died at the age of 66. Her body was brought home and a special train from Grand Central Station took mourners to Woodlawn Cemetery on December 7. Abby may have been visiting her son at the time of her death. Ferris was living permanently in Paris at the time. Nevertheless, he did not sell the Madison Avenue mansion, but leased it furnished in October of the following year to wealthy pharmacist and "perfumer" Richard Hudnut and his wife. The Hudnuts would be forced to find new accommodations following Ferris Thompson's death in Paris on February 18, 1913. 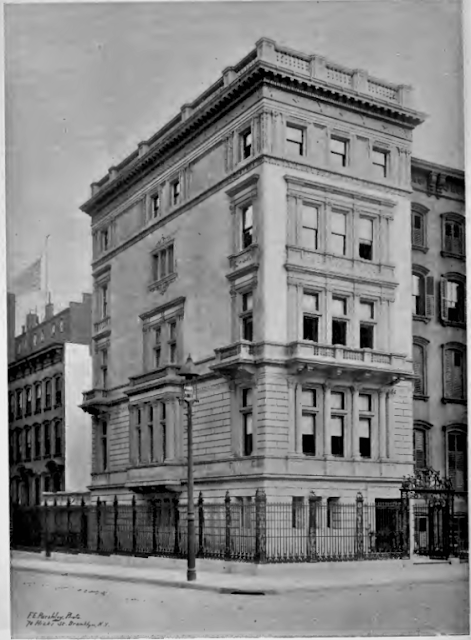 The Madison Avenue house, valued at $5.4 million in today's money, was part of the bequest to his wife, Louise. It was quickly purchased by Ferris's aunt, Mary Lee Clark Thompson. Her husband Frederick Ferris Thompson, who was Samuel C. Thompson's brother, had died in 1899. (She was, incidentally, the daughter of former New York State Governor Myron Holley Clark.) The purchase was an investment only. That same year she leased the mansion to the Aero Club of America. Among the club's first events was a dinner and reception for Orville Wright on December 17, 1913. That evening he told reporters that he had "nearly perfected" an innovation "which, he says, will make flying as easy as driving an automobile," reported The Sun. After war broke out in Europe, the Aero Club of America was outspoken in its criticism of the military's lack of preparedness. A meeting in the Madison Avenue headquarters on June 3, 1915 brought together representatives from "all the organizations interested in national defence." Among the long list of attendees was Theodore Roosevelt, Jr., representing the American Legion; and S. Stanwood Menkin, president of the National Security League. The Sun reported the following day "It was the consensus that one of the most essential needs to meet the grave condition of unpreparedness in this country is a council for national defence established by Congress." With the country now involved in the conflict, the Aero Club of America hosted aviators "of the special Italian aeronautic mission" on September 3, 1917. The commission was in the U.S. in part to negotiate the construction of Italian warplanes (called the Caproni) here. The Sun reported that Italian Major R. Perfetti "expressed the hope that a group of patriotic Americans or the American Government might undertake to construct the machines here." The Aero Club of America was frustrated that the American Government seemed to undervalue the importance of the airplane in battle. On March 19, 1918 the club issued a statement that said in part "Lack of an adequate financial appropriation is crippling the United States aero service and rendering impossible the development of an aviation programme such as is required for the proper prosecution of the war." To the defense of Congress, it had appropriated $640 million for aircraft work. The Aero Club of America argued that three billion in 1918 dollars was necessary. Following the war the Aero Club of America returned to more peaceful gatherings. Captain Rene Fonck, leading French military aviator was feted here in February 1919, and three months later noted French aviator Lieutlenant E. C. Parsons visited the club. Back in 1913, when the Aero Club of America first moved into the former Thompson mansion, it had won for the fourth time the international balloon trophy, first offered in 1906 by James Gordon Bennett. When World War I broke out, of course, the competitions had ceased and the Bennett Air Trophy was still proudly displayed in the Madison Avenue clubhouse. Now, in February 1920, Belgium sent a telegram challenging the Aero Club of America. And it was not the only country with the trophy in its sights. The New York Herald reported on February 29 "France, Great Britain, Italy and Switzerland are expected to compete this year, an elimination preliminaries will probably be held among America aero clubs for the right to defend." The Aero Club of America was dealing with another threat at the time. Its landlord, Mary C. Thompson, had been buying up the other properties along the Madison Avenue block. 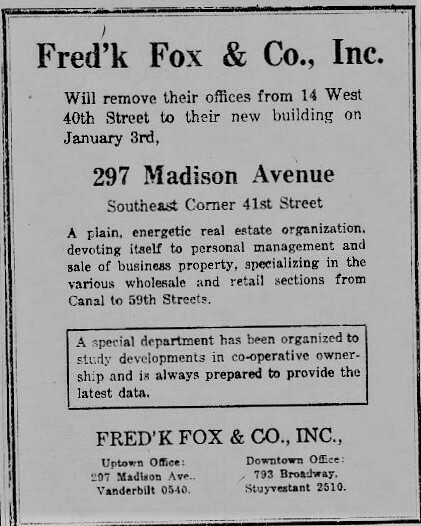 Four days before the New York Herald's article about the balloon challenge, the New-York Tribune had reported that Mary Thompson "now owns all of the Madison Avenue frontage from Fortieth to Forty-first Street, with the exception of a four-story building at 295 Madison Avenue...It is reported that negotiations are in progress for a lease of the entire property for an important commercial improvement." While Mary Thompson negotiated for No. 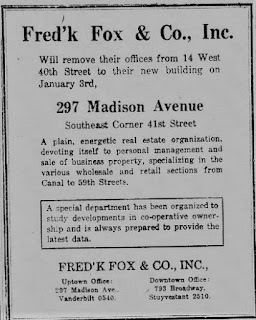 295 next door, she leased the mansion to Frederick Fox & Co., a realty firm, as its headquarters. On January 23, 1921 The New York Herald reported that the organization "is utilizing two floors for its business. The ground floor is being used by the bookkeeping, management and insurance departments. The private offices of the members of the firm and brokerage staff are on the second floor." The third floor, part of which was originally Abby Thompson's library, was to be rented. "Negotiations are well advanced for the leasing of the two upper floors to one tenant," said the article. Interestingly, Mary C. Thompson lived just a block to the south, at No. 283 Madison Avenue. She died in her summer home, Sonnenberg, at Canandagua, New York on July 29, 1923. 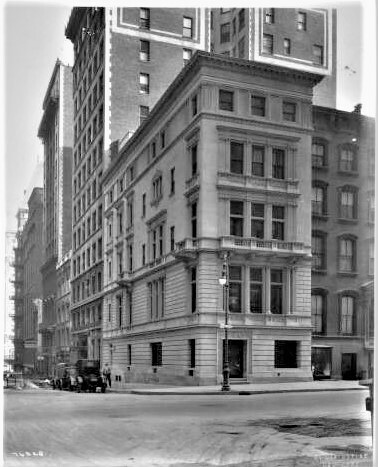 If she had planned to fill the Madison Avenue blockfront where the Thompson mansion stood with a single commercial building, her death derailed the project. No. 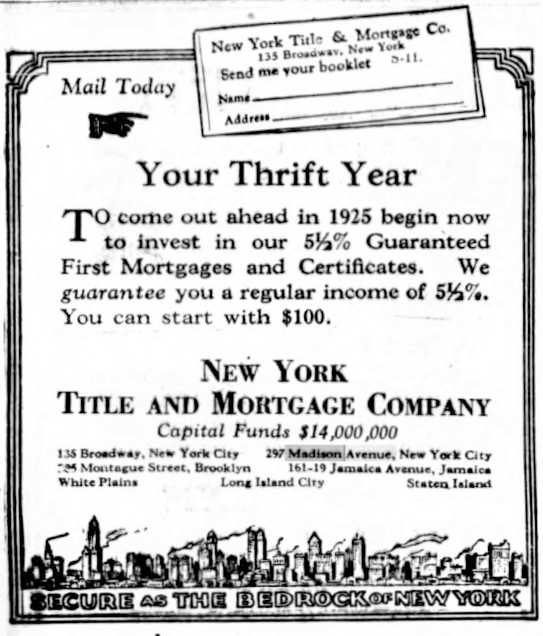 297 was acquired by the American Trust Company and New York Title and Mortgage Company in January 1924. Before moving in the firms updated the structure, slicing off Abby Thompson's bay window and moving the entrance from the south to the north. Large show windows were carved into the first floor stonework and the rooftop balustrade was removed. The renovations were completed by the fall of 1924 and on November 10 The New York Telegram announced the building's opening. The two companies "will occupy the entire building," said the article. 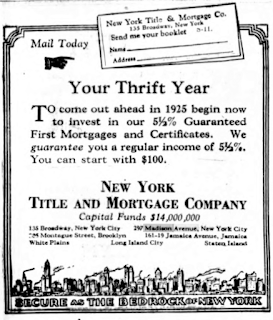 "The American Trust Company occupies the first floor and mezzanine, and offices of the New York Title and Mortgage Company are on the next floor; conference and closing rooms for real estate titles occupy the other floors." The two firms would not remain in the renovated structure for long. Abraham E. Lefcourt did what Mary C. Thompson had been unable to do--he purchased No. 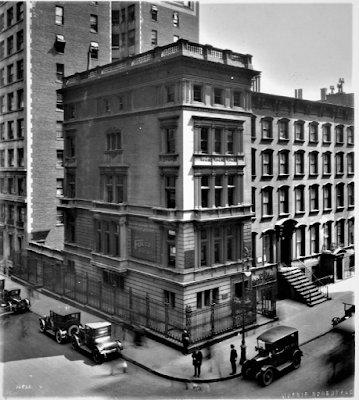 295 Madison Avenue and in 1927 demolished both buildings. 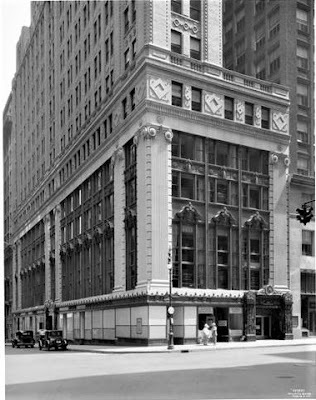 The 45-story replacement Leftcourt Colonial Building designed by Charles F Moyer Comopany and Bank & Djorup was competed in 1930. "As a point of interest you may know, cosmetic tycoon Richard Hudnut was married to the former Winifred Kimball whose previous husband had been Elsie de Wolfe’s brother. Winifred de Wolfe ran Elsie’s New York business for a period. Her daughter from a first marriage, Winifred Shaughnessy, was adopted by Hudnut, changed her name to Natacha Rambova and famously married Rudolph Valentino. Rambova’s pretensions as an expert in all things artistic and overbearing interference is said to have negatively affected Valentino’s career."